From concept to creation, learning at Yale transcends the confines of a classroom. Through their work in the Medical Device Design Course (MENG 404), a team of Yale students won the first place prize of $10,000 in the BMEStart competition. 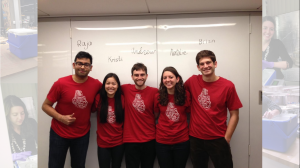 Natalie Pancer (YC ’14), Andrew Crouch (YC ’14), Brian Loeb (YC ’14), Raja Narayan (YSPH ’14), and Kristi Oki (YC ’14) developed a novel method of preserving and transporting the small intestine during the transplant process. The BMEStart Competition, sponsored through VentureWell, aims to distinguish excellent undergraduate feats in biomedical engineering. The Intestine Perfusion, Preservation and Transportation Device (IPPTD) is a revolutionary design expected to improve the current standard of care in intestinal transplants. Currently, many intestinal transplants do not remain functional after the transfer process. Once the organ is collected, the normal practice is to place it in a plastic bag with a standard solution and move it using an ice cooler. Though it typically works for other organs, this system cannot support the many blood vessels throughout the small intestine, resulting in tissue damage and death. With the support of Professor of Surgery and Director of Surgical Research John Geibel and other professionals at the Yale School of Medicine, students sought to improve the technique. In order to confront the existing challenges, the team invented a pump perfusion system to help the carrying solution reach more of the system of blood vessels. The IPPTD is composed of two pumps that suffuse the small intestine from the inside with a specialized solution: a closed loop for the lumen and an open system for the vasculature. This approach helps to remove cellular waste product and harmful oxidizing agents from the intestine, increasing the viability of the transplanted organ. In addition, the team developed a more stable container to steady the intestine during transportation, preventing mechanical damage. Members of the student team. From left to right: Raja Narayan, Kristi Oki, Andrew Crouch, Natalie Pancer, and Brian Loeb. Courtesy of Natalie Pancer. After designing the device, the students ran experiments to prove its potential. Collaborating with engineers, professors, and surgeons, the students were able to build and test a prototype. Using pig intestines, the team compared the traditional method with their new device. Partnering with the pathology department, histological stains revealed that the intestine transported using the IPPTD was more intact and had sustained less damage after arriving at its destination than the control intestine. The team not only won the BMEStart Competition, but also presented at the Society for Surgery of the Alimentary Tract meeting this past May. The product is in the process of gaining a full patent and is being further developed for clinical use. Objectively speaking, the pilot course MENG 404 was a success. Taught by Assistant Director of the Center for Engineering Innovation and Design Joseph Zinter and former School of Medicine research scientist Richard Fan , the class was intended to spur undergraduate innovation in medicine. “[We] wanted to design a class that could help Yale engineering students get a better understanding of the practical aspects of bridging engineering and medicine, and see if [they] could find new interesting opportunities for innovation,” Fan explained. At the beginning of the semester, several doctors presented issues they had observed in the clinic. Students then formed teams focusing on each of the cases in order to work to develop a solution. Pancer, Crouch, Loeb, Narayan, and Oki found Geibel’s pitch on intestine transport to be the most interesting, joining together to tackle the challenge of increasing small intestine transplant success. Other teams last fall advanced home monitoring for epilepsy, new tools for oral surgery, and mechanisms for subcutaneous drug delivery. Now in its second year, the course will offer a new group of students the opportunity to solve real-world medical challenges.